41 Commonwealth is located on the north side of Commonwealth, between Berkeley and Clarendon, with 39 Commonwealth to the east and 43 Commonwealth to the west. 41 Commonwealth was built ca. 1869, one of four contiguous houses (41-43-45-47 Commonwealth) built at the same time as two symmetrical pairs, and one of ten contiguous houses (29-31-33-35-37-39-41-43-45-47 Commonwealth) built in the same design between 1863 and 1873. 41-47 Commonwealth were built for lumber merchant, real estate investor, and banker Elijah Chesley Drew and his wife, Hannah (Haines) Drew. They made 41 Commonwealth their home, and sold the other three houses. 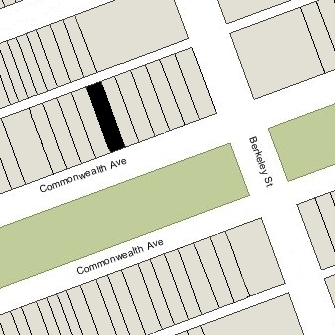 They previously had lived at The Commonwealth Hotel in the South End, which he owned. Click here for an index to the deeds for 41 Commonwealth. In 1872 and 1873, the Drews were joined at 41 Commonwealth by his brother and sister-in-law, Ira Towle Drew and Lydia Ann (Straw) Drew. He was a lawyer. By 1875, they had moved to the Commonwealth Hotel. Elijah Drew died in January of 1877. Hannah Drew moved soon thereafter. On January 5, 1877, a few weeks before his death, Elijah Drew sold 41 Commonwealth to Charles B. Wilson, a real estate dealer. On October 22, 1877, 41 Commonwealth was purchased from Charles Wilson by silk and millinery dealer William Henshaw Horton. He and his wife, Augusta (Kimball) Horton, made it their home. They previously had lived at 30 Hancock. The Hortons continued to live at 41 Commonwealth in 1894, but had moved to the Hotel Vendôme by 1895. On April 4, 1895, 41 Commonwealth, was purchased from Charles Wilson by Sylvanus F. Van Choate. He and his wife, Georgie (Morse) Van Choate, made it their home. They previously had lived at 1106 Boylston. Sylvanus Van Choate was an inventor of various electrical and telegraphic equipment, including light bulbs, insulators, switches, and submarine repeaters for underwater cable transmission. In 1891, he founded the Van Choate Electric Company with a capitalization of $6 million, for the purpose of manufacturing electric light and electrical appliances. The firm went bankrupt in 1900, having never produced any products. 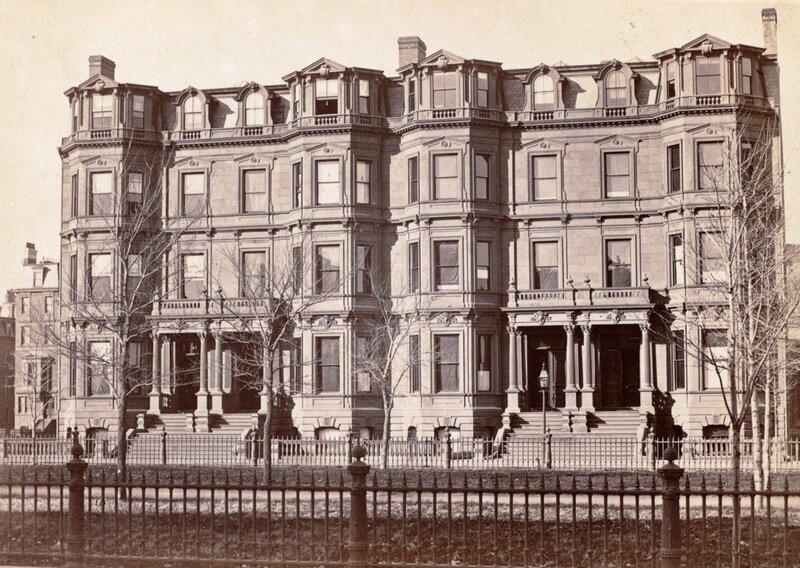 The Van Choates continued to live at 41 Commonwealth during the 1899-1900 winter season, but moved soon thereafter to 7 Newbury. On May 24, 1900, the estate of Reuben E. Demmon, which held Sylvanius Van Choate’s mortgage, foreclosed and transferred 41 Commonwealth to attorney Charles Calvin Bucknam. On October 15, 1900, 41 Commonwealth was purchased from Charles Bucknam by Charles A. King. He and his wife, Gertrude Frances (Wright) King, made it their home. The Kings previously had lived at 441 Beacon. Charles and Gertrude King had come to Boston in about 1872 from England. He was a brewer and owned the Continental Brewing Company. In August of 1900, Continental and nine other companies merged to become the Massachusetts Breweries Company. Gertrude King died in June of 1910. Charles King remarried in 1911 to his deceased wife’s niece, Marjorie F. Despard, the daughter of William Frederick Despard and Augusta Mary (Wright) Despard, Gertrude (Wright) King’s sister. They continued to live at 41 Commonwealth. Charles King died in January of 1938. Marjorie King continued to live at 41 Commonwealth until about 1943. By the time of the 1940 US Census, she had begun accepting lodgers. The house was shown as vacant in the 1944 City Directory. On May 2, 1944, 41 Commonwealth was purchased from Marjorie King by the Trustees of Donations to the Protestant Episcopal Church. It became the home of Rt. Rev. Henry Knox Sherrill, the Episcopal Bishop of Massachusetts, and his wife, Barbara (Harris) Sherrill. They previously had lived at 155 Beacon. 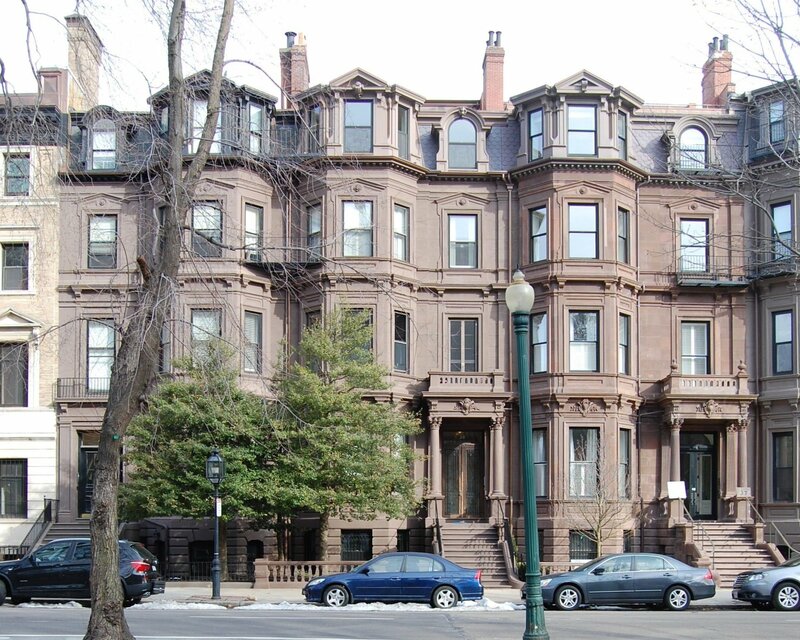 The Sherrills continued to live at 41 Commonwealth until 1947, when he stepped down as Episcopal Bishop of Massachusetts, after which he served as the Presiding Bishop of the Episcopal Church until 1958. By 1947, 41 Commonwealth was the home of Rt. Rev. Norman Burdett Nash and his wife, Marian (Noble) Nash. The former Rector of St. Paul’s School in Concord, New Hampshire, Norman B. Nash was Henry Knox Sherrill’s successor as Episcopal Bishop of Massachusetts. He served as leader of the Episcopal Diocese of Massachusetts until his retirement in 1957. 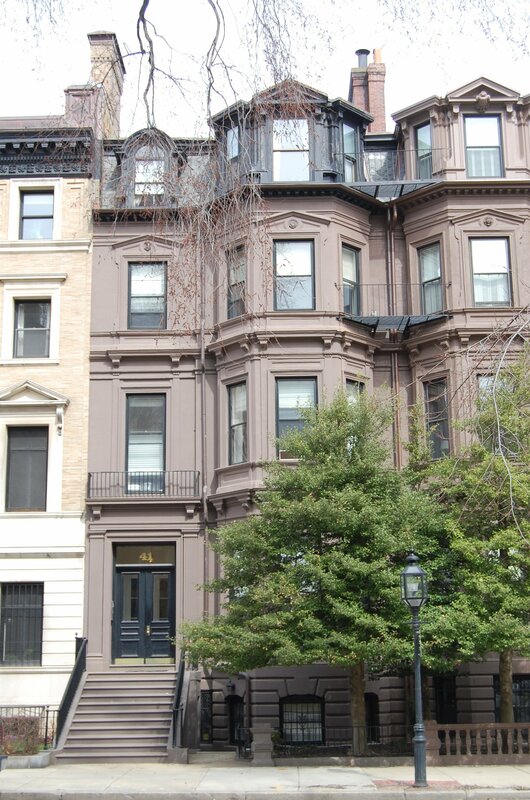 The Nashes continued to live at 41 Commonwealth until shortly before his retirement, after which they probably moved to Cambridge where they were living at the time of his death in January of 1963. On November 8, 1956, 41 Commonwealth was purchased from the Episcopal Diocese by real estate dealer Thomas J. Diab. On November 19, 1956, he transferred the property to himself and Nick Haddad, who then transferred his interest back to Thomas Diab on August 6, 1957. 41 Beacon was shown as vacant in the 1957 City Directory, and had become a multiple dwelling by 1958. On February 9, 1959, 41 Commonwealth was acquired from Thomas Diab by Nick Haddad as trustee of the Cook Realty Trust. In September of 1977, he filed for (and subsequently received) permission to legalize the occupancy as nine apartments, there being no previous record of the legal occupancy. On December 1, 1977, 41 Commonwealth was acquired from Nick Haddad by attorneys Laurence Eric Hardoon and Paul S. Samson. In September of 1975 they had acquired 39 Commonwealth and in April of 1977 they had acquired 37 Commonwealth. All three buildings remained apartment houses. On December 19, 1986, 41 Commonwealth was purchased from Laurence Hardoon and Paul Samson by Puritan Properties, Inc. (Vincent P. Giarrusso, president). 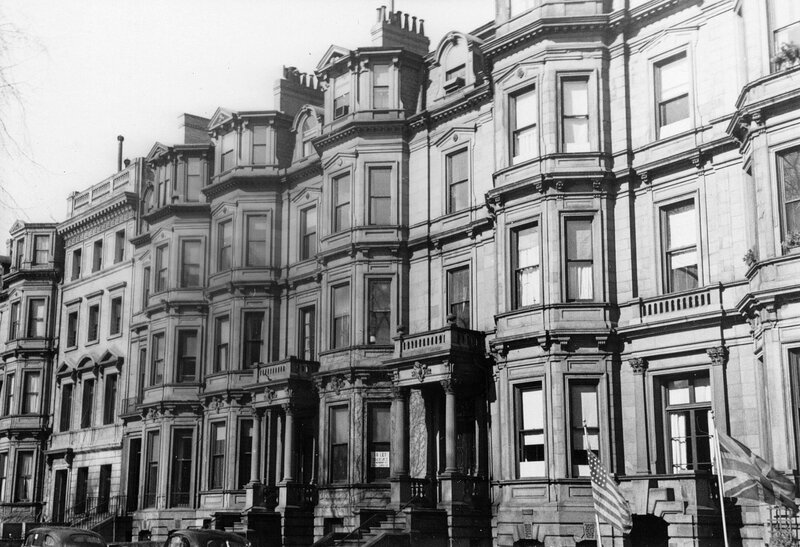 On January 30, 1987, Puritan Properties converted 41 Commonwealth into nine condominium units, the 41 Commonwealth Avenue Condominium.